The models EA 217 and EA 219 are the office swivel chairs in the Soft Pad Group by Charles and Ray Eames. Their dignified aura makes them especially suited for management areas. The extraordinary comfort of the chairs results from the combined effect of their tilt mechanism, which can be adjusted to the users weight, and the soft upholstery. 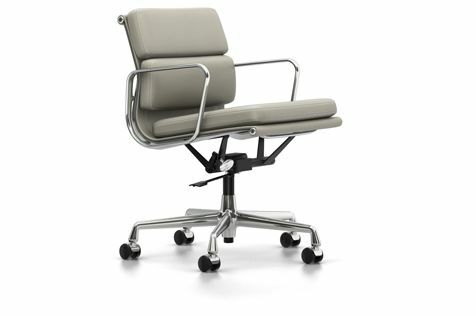 The higher backrest of EA 219 distinguishes it from the Soft Pad Chair EA 217. Medium-high backrest, Sewn-on cushions with polyurethane foam upholstery in Leather or Premium Leather (latter version with topstitching). Side profiles and spreaders in polished or chrome-plated die-cast aluminium. Five-star base in polished or chrome-plated die-cast aluminium. Equipped with hard castors for carpet or soft castors for hard floors. Castor covers in black for polished base, with chrome-plated finish for chrome base.